What does this post have to do with the Olympics? Well, the meal I describe herein, while not medal-winning, comprises a few different nationalities. First of all, I wanted to do something with the quart of leftover bulghur pilaf I made last weekend. We had ground lamb in the freezer; my first thought was to make kibbeh, but it seemed like more than I wanted to tackle at the time. Then I searched for and found a recipe for a lamb and bulghur meatloaf, which was more to my liking - fast and easy. I doubled the quantities of garlic, bulghur, and lamb (because I had a pound of lamb) and kept everything else the same. The result was delicious, although I could probably have added more cumin. I didn't have any mint, which would have been a nice addition. Maybe some feta too. As an accompaniment, I made German potato salad. Yes, I know - weird. But my friend Stacey had called earlier in the week to request a recipe for a warm potato salad and I found this one while I was on the phone with her. Plus we had both bacon and potatoes in the house. To add to the league of nations, I threw a handful of Italian-style green beans in the microwave to cook through. And you know what? Everything meshed perfectly together. 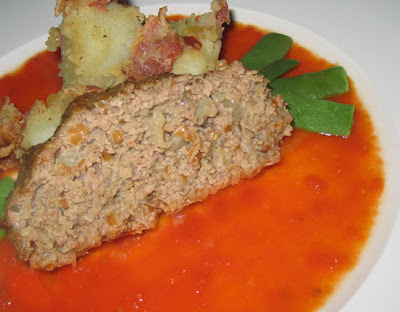 The tomato sauce and the potato salad both had a bit of vinegar, which was a nice counterpoint to the rich yet light meatloaf, and the green beans were terrific with the tomato sauce. In fact, I'll probably use the leftover sauce to make a variation of Greek-style green beans with tomatoes. For the Olympics, I make (or order if I'm lazy) international, or international-inspired, food almost every night. We've had restaurant Chinese and homemade tuna teriyaki, tacos, chicken Parmigiana with angel hair pasta and red sauce, and Australian meat pies, just to name a few. Tonight I'm making a simple French chicken recipe that I found on the Web and serving it with a salad and French bread. It makes the Olympics even more fun. That sounds like a fun idea! I'll have to keep that in mind to do for the Summer Olympics.